There is no mystery at all, to why Yogi Berra should join the long list of famed athletes Stephen Holland has painted. Yogi, in his career, achieved amazing feats; fifteen-time All Star, winning the AL MVP three times, in 1951, 54 and 55. He played in 14 World Series and holds numerous World Series records, including most games by a catcher (63), hits (71), and times on a winning team (10), first in at bat, first in doubles, second in RBI's, third in home runs and BOB's. Yogi also hit the first pinch hit home run in World Series history in 1947. But that's not who Yogi is to Stephen Holland. Much more then a champion of stats, Yogi was one of the few players who created the personality of baseball of the time. From his artful distracting chatter behind the batters on deck to his famous "Yogi-isms" in the press, he added so much more to the game then just his playing skills alone. 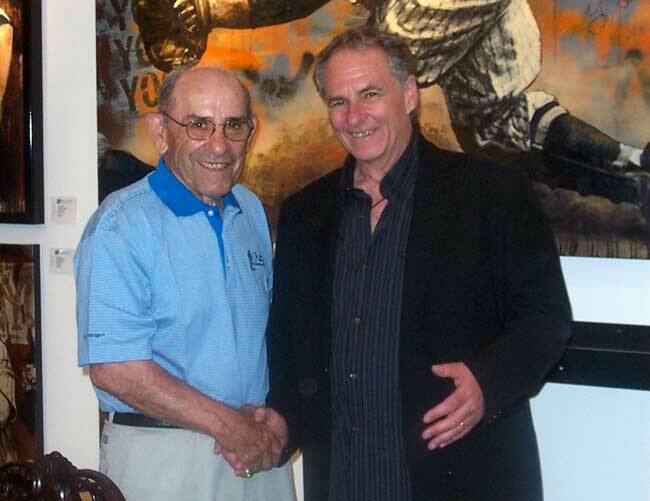 This month Yogi and Stephen were able to meet for the first time, as Yogi Berra came out to be a part of the unveiling of his new limited edition by Holland.